The forest is cluttered with a variety of wonderful objects that are not native to the forest. Some of them are completely harmless (donuts, tents, wind). Some of them seem to serve no purpose to the forest (tires, chairs, strange birds). And some are downright bad for the forest’s overall well being (the deer across the river). Throughout my travels of the forest, I have found a great number of these curious artifacts. I almost always stop to inspect them. Sniff them. Lick them. Stare at them. However, no matter how I approach these objects, nearly all of my interactions with them have one thing in common: I usually accidentally break them. I never mean to end the life of the strange objects I find in the forest, but I almost always do. Take, for example, a lovely plastic chair I recently stumbled upon. It was a beautiful red color, some of it fading into a more orange hue from exposure to the sun. It had to have been in the forest for quite some time, so I felt beckoned to examine it beyond a simple glance from afar. It was still, so I was assured that any further poking around would not be met with some kind of violent reaction from the chair. It smelled like dirt. It also smelled a little bit like insects (not any specific kind that I could detect). Dirt. Again. Also insects. Again. I think I could taste the sun on it, too, but then again, I am not entirely certain what the sun actually tastes like (though I have my theories). The chair was withstanding nearly every part of my normal investigation pattern: approach, sniff, lick. I only had one step left: sit. I frequently find myself trying to sit on new things I find in my ever vigilant search for the most comfortable things in the forest. Was this chair going to be comfortable? At the time, I had no idea, but I had to know. So I sat on the chair. It was nice for a moment. A brief moment. Then the tiny legs of the chair snapped and I found myself hurtling toward the ground. It was not a long trip from the top of the chair to the ground, but it was long enough to frighten me and send me running off into the forest. At the time, I did not know that this action was me actually killing the chair by accident. I had to run away just in case this was the chair’s way of trying to kill me on purpose. I hid behind a tree for awhile. When I felt like it was safe to come out, I did. The chair was still broken. Its sad cracked legs were shattered. Pieces of them were scattered around the forest floor. I felt guilty. I put the broken chair through the same process of investigation as I had the whole chair (approach, sniff, lick, sit). This was to ensure that the chair did not change its mind about not being violently reactive to something after becoming a broken chair. It did not break again when I sat on it the second time, but it was clear that I had left a significant amount of damage from my investigation. I like finding new things in the forest. I like investigating those new things, too, but I wish I knew a more effective, less damaging manner of doing so. I am sorry, chair that I broke. Also, I am sorry, everything else I have sat on by accident or on purpose. That includes you, the opossum who was nesting in my moss collection. It was an accident, opossum. I promise. I just want to know more about where I live, and I hope I can learn how to do so in ways that do not leave chairs and opossums upset and/or crushed. 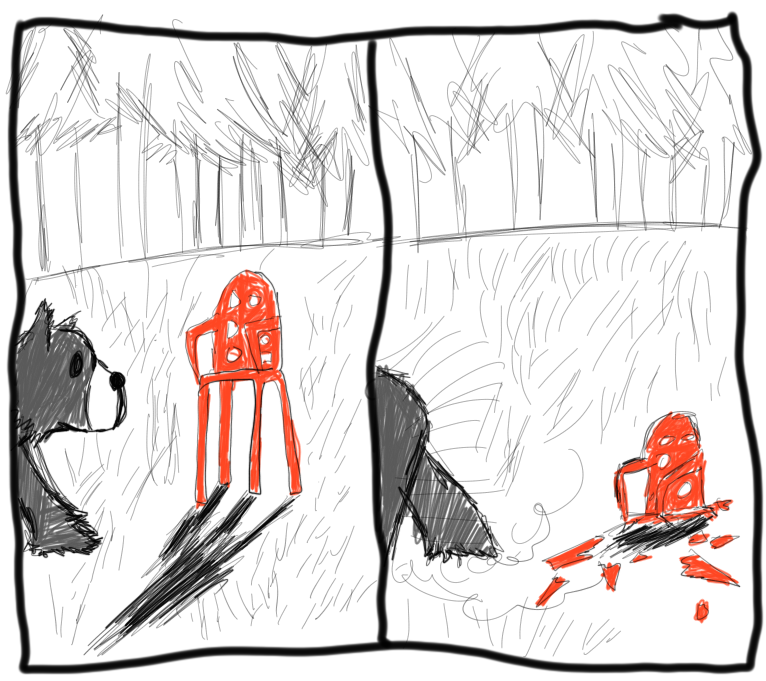 This entry was posted in Bear thoughts and tagged @a_single_bear, bear thoughts, bears, chair, chairs, finding things, humor, the forest, twitter on July 13, 2015 by A bear.